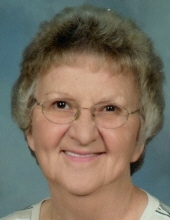 Marilyn Y. Elmore, age 81, of Council Bluffs, passed away April 6, 2019 at Longview Nursing Home in Missouri Valley, Iowa. Marilyn was born August 23, 1937 in Petersburg, Nebraska to the late Edmund P. and Mary A. (Smyth) Meyer. She was a bill sorter for 1st National Bank for 12 years. Marilyn was a member of Queen of the Apostles Catholic Church and the Altar & Rosary Society. In addition to her parents, Marilyn was preceded in death by her granddaughter, Jessica Elmore in 2013; brother, Edward Meyer and former husband, Marion Elmore in 1990. Marilyn is survived by her daughter, Pamela Elmore of Council Bluffs; son, Robert (Kim Tyrey) Elmore of Omaha; grandchildren, Alex Jackson and Lucas Ridgway; sisters, Pat (Jack) Watson, Phyllis Shanks all of Omaha; brothers, Dan (Carolyn) Meyer of Bennington, Nebraska, Tom (Leslie) Meyer of Blair, Nebraska, Jerry Meyer and Bob Meyer both of Omaha; many nieces and nephews. To send flowers or a remembrance gift to the family of Marilyn Y. Elmore, please visit our Tribute Store. With a lunch at the Walnut Hill Reception Center, 1350 E. Pierce St. following burial. "Email Address" would like to share the life celebration of Marilyn Y. Elmore. Click on the "link" to go to share a favorite memory or leave a condolence message for the family.